I was lucky enough to receive a bottle of this from my parents for Father's Day. They live just outside Portland and made a trip to House Spirits Distillery just to grab a bottle for me and bring it with when they visited. The first thing that must be fronted about this whiskey is the cost. A 375 ml bottle of this whiskey will set you back a cool $50. A very steep price for such a young whiskey. I realize that craft distillers such as House Spirits need to earn back their investment as soon as possible and can't wait for their whiskey to age, but this price is nonetheless prohibitive. That being said, I was still happy to get a chance to try this whiskey that is otherwise unavailable on the shelves by me, particularly when it was gifted to me. On the first sip, the whiskey tasted its age. It wasn't complex, and nothing particularly stood out, other than the prominent taste of wood. 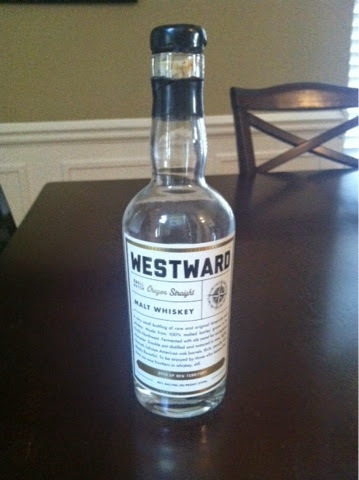 However, I let the bottle sit for a couple weeks and revisited it, and I could not have been more impressed. What was otherwise a boring whiskey transformed into something excellent. Suddenly the whiskey burst with flavors of toasted almonds and honey. The barley and bread flavors were much more prominent, muting the previously strong wood flavor. It also took on a grassy, almost hoppy flavor. This is a single malt whiskey that bears more resemblance to Scotch than to bourbon. While at first I was disappointed, I found that by the end of the bottle this was a very enjoyable whiskey, tasting much more complex than it should at its age. Even though the cost may be a bit prohibitive, it left me wanting more.